Kuuma boat horizontal rail mount for Kuuma marine barbecue grills. Part number 58182. Designed to mount your Kuuma Grill to your boat’s railing. Can be used on 7/8″ to 1-1/4″ round or square horizontal rails. New Kuuma Stow N’ Go Elite 216 barbecue gas grill. Model number 58155. Integrated fold-away legs enable easy grilling on any flat surface. Or use one ofKuuma’s boat rail or rod holder mounts. Describe the nature of the problem and its urgency (include pictures if possible). New Kuuma Kettle barbecue gas grill. Model number 58102. Use one ofKuuma’s boat rail or rod holder mounts to complete your installation. Designed for 1-lb disposable propane bottles. Lift-and-Clean liner makes it easier to clean the grill and reduce grease build up. New Kuuma Kettle barbecue charcoal grill. Model number 58103. Use one ofKuuma’s boat rail or rod holder mounts to complete your installation. Lift-and-Clean charcoal tray for easy cleaning. Designed for use with any standard charcoal. New Camco Do-It-Yourself boat winterizer. Part number 65501. Easy-to-use gravity flow system for winterizing outboards and sterndrives (I/O). Uses 5 gallons of antifreeze – Use only antifreeze approved for engine winterization. Part Number: 41545. Its sturdy ABS resin construction is compact and lightweight. It supports up to 330 lb. 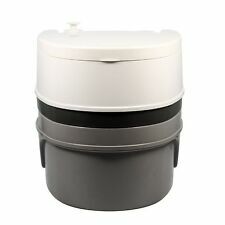 Travel Toilets 5.3 gal. Sealed gate valve locks in odors and protects against leakage. 2.5/5.3 gallon holding tank is detachable. New Kuuma Stow N’ Go 160 barbecue gas grill. Model number 58130. Integrated fold-away legs enable easy grilling on any flat surface. Or use one ofKuuma’s boat rail or rod holder mounts. Describe the nature of the problem and its urgency (include pictures if possible). New Kuuma Profile 150 barbecue gas grill. Model number 58121. Integrated fold-away legs enable easy grilling on any flat surface. Or use one ofKuuma’s boat rail or rod holder mounts. Describe the nature of the problem and its urgency (include pictures if possible). New Kuuma Stow N’ Go Elite 316 barbecue gas grill. Model number 58173. Integrated fold-away legs enable easy grilling on any flat surface. Or use one ofKuuma’s boat rail or rod holder mounts. Describe the nature of the problem and its urgency (include pictures if possible). Kuuma boat rod holder mount for Kuuma marine barbecue grills. • Kuuma’s rod holder mount enables you to turn any fishing rod holder into a grill mount. • The rod holder mount has a 60 degree angle and an adjustable height. Kuuma Elite 216 Gas Grill with Regulator. New Kuuma Stow N’ Go 160 barbecue gas grill. Model number 58131. Integrated fold-away legs enable easy grilling on any flat surface. Or use one ofKuuma’s boat rail or rod holder mounts. Describe the nature of the problem and its urgency (include pictures if possible). Part Number: 51600. Fly your flag anywhere you park your RV. Includes a durable car foot and storage bag. New Kuuma Profile Cubed 150 barbecue gas grill. Model number 58162. Integrated fold-away legs enable easy grilling on any flat surface. Or use one ofKuuma’s boat rail or rod holder mounts. Describe the nature of the problem and its urgency (include pictures if possible). New Kuuma Profile 216 barbecue gas grill. Model number 58161. Integrated fold-away legs enable easy grilling on any flat surface. Or use one ofKuuma’s boat rail or rod holder mounts. Describe the nature of the problem and its urgency (include pictures if possible). New Kuuma Stow N’ Go 125 barbecue gas grill. Model number 58140. Integrated fold-away legs enable easy grilling on any flat surface. Or use one ofKuuma’s boat rail or rod holder mounts. Describe the nature of the problem and its urgency (include pictures if possible). Normalized SKU: 22833. Heavy Duty reinforced 5/8" ID drinking water hoses are 20% thicker than our standard hoses. Anti-kink design features machined fittings and strain-relief ends for added durability. Camco Boat Marine RV Coiled Hose Kit -. - 20' Coiled Hose with Strain Relief. - Nozzle with Thumb Lever. Harvard Marine. - Swiveling, Quick Connect Fitting. Kuuma 11916 Magnesium Anode and Drain Valve. 6 Gallon Capacity. 120V Operation at 60Hz. Cold Water Inlet 1/2” Female NPT. Warm Water Outlet 1/2” Female NPT. Engine Water Inlet/Outlet 5/8" O.D. © Marine Parts Source. Microfiber material allows wash pad to remove more dust and dirt than traditional cloth. Wash pad has Hook-and-loop side panel for easy removal. New Kuuma marine 6 gallon water heater for use on boats. Part number 11812. The Kuuma 11812 water heater can replace Whale and Seaward water heater models S600, S600W, and S700. Electrical Input: 120V – 50Hz/1500W. DIY Winterizer Kit Includes: Antifreeze Tank, On/Off Valve, Ball Valve, Winterizi. 6 Gallons -50 Non-Toxic Antifreeze. DIY Winterizer Kit. DIY Winterizer. Poly vinyl amber rollers are long lasting, will absorb shock, are cut resistant and will not mark or mar your boat. Portable Toilets are designed for camping, RVing, boating or any other recreational activity. Sturdy polyethylene construction is compact and lightweight. The holding tank is detachable and includes a sealing slide valve to lock in odors and protect against leakage. New Kuuma marine 11 gallon water heater for use on boats. Part number 11841. The Kuuma 11841 water heater can replace Whale and Seaward water heater models F1100, F1100W, and F1200. Part Number: 11841. Connect the TastePURE Water Filter to your drinking water hose for safer, cleaner water. New Kuuma marine 6 gallon water heater for use on boats. Part number 11811. The Kuuma 11812 water heater can replace Whale and Seaward water heater models F600, F600W, and F700. Part Number: 11811. This ergonomically designed shower head features a convenient on/off switch, which allows you to pause the flow of water while shampooing. Pausing the water when you don't need it greatly reduces the amount of water used. MODEL PD-50 55306. Includes diagnostic lights for visual indication of faults. Water resistant unit incorporates integrated multilevel surge protection and diagnostic lights for visual indication of faults. Armada by Camco-Boat Soap w/Carnauba Wax&#44; 32 oz. Kuuma 11916 Magnesium Anode and Drain Valve. 11 Gallon Capacity. 120V Operation at 60Hz. Tank and Exterior Jacket are Composed of Aluminum Alloy. Cold Water Inlet 1/2” Female NPT. Warm Water Outlet 1/2” Female NPT. Manufacturer PN: 58184. Rack: RAA- 58184. Model: Pedestal Grill Mount. Shelf: TO MD 4040. BIN: C17 MD 5415-9654. Do-It-Yourself Winterizing Kit. Winterizing Tee. Requires only antifreeze and your flusher (not included). Uses only 5 gallons of approved antifreeze. Antifreeze Tank. Winterizes your boat right on the trailer. Part Number: 41970. The Boat Cover Support is self-standing with support plates on the top and bottom, the bottom support plate also has a foam pad to prevent sliding and protect the boat. The nylon strap assembly is 50' long and fits most boats up to 22' in length. Trending at $43.77eBay determines this price through a machine learned model of the product's sale prices within the last 90 days. RhinoFLEX sewer hose fittings are designed to work with the RhinoFLEX hose. Made with UV stabilized resin for long life. Each of the three easy-to-use fittings features a reusable locking ring so that fittings can be moved to a new RhinoFLEX hose. Model Number: 65501. Manufacturer Part Number 65501. D-I-Y Boat Winterizer Engine Flushing System. Quickly and efficiently service inboard/outboard marine engines. The Do-It-Yourself Winterizer allows flushing and preparation of boat engine for winter storage with just five gallons of antifreeze and your flusher. New Kuuma marine 11 gallon water heater for use on boats. Part number 11842. The Kuuma 11842 water heater can replace Whale and Seaward water heater models S1100, S1100W, and S1200. Part Number: 11842. Part Number: 40263. TST 30 Drop-Ins. 1 pouch treats an entire tank. Septic tank safe. No harmful formaldehyde. Provides mounting options for newer model pontoon boats. MPN: 690120.